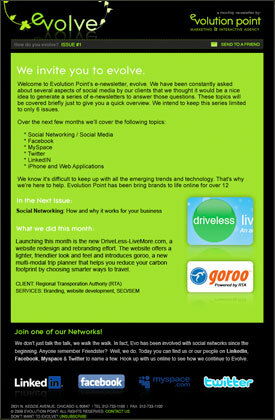 Keep informed about marketing trends, social media, branding, design and much more through Evolve, the Evolution Point Newsletter. Simply fill out the forms below, sit back and relax– your information is safe with us. You can also read our past newsletters by selecting from the list on the left. In the past, we have a 6-issue series about social media. Presently, we have a monthly, 12-issue series on a strategic marketing case study. If you have any interest in learning how marketing is executed or how marketing can make your company a success, we encourage you to sign up for the newsletter.